 [Multifunction Smart Watch]: Dial via watch SIM card or Bluetooth, Pedometer, Sedentary remind, Sleep monitoring, Message reminder (from the text, phone, and other app notifications), Camera controllers, Music players, and more. Once you use a smart watch, this Bluetooth watch will make your life easier and more convenient.  [Long-lasting Battery]: More capacity, longer endurance. Full charge requires only about half an hour and the standby time can be up to 5-7 days with full power. And we provide an extra replacement battery of this Bluetooth smart watch for you, never worry about the problem of having no electricity on the Bluetooth smartwatch.  [Wide Compatibility & Stable Connection]: Topffy smart Watch adopt Bluetooth V4.0 technology to connect your phone. Up to 33ft connection range guarantees low signal delay. And this smart watch is fully compatible with all Android phones and Apple IOS phones on the market. Like IPhone, Samsung, Nexus, Huawei, HTC, Sony, LG, Google Pixel, ZTE, OPPO, XIAOMI, Motorola and so on.  [Comfortable and Durable Bluetooth Smart Watch]: Stainless steel surface, precision laminating process, Nano TPU85 material watch strap, anti-sweat matte finishing, ergonomic convex design and soft strap which make wearing more comfortable. Unique waterproof design, good for outdoor activity. And the Smart Watch also equipped with 1.54" TFT LCD 2.5D radian capacitive touchscreen, which has 240*240 pixels resolution make the screen clear and bright.  [It a Nice Gift!] 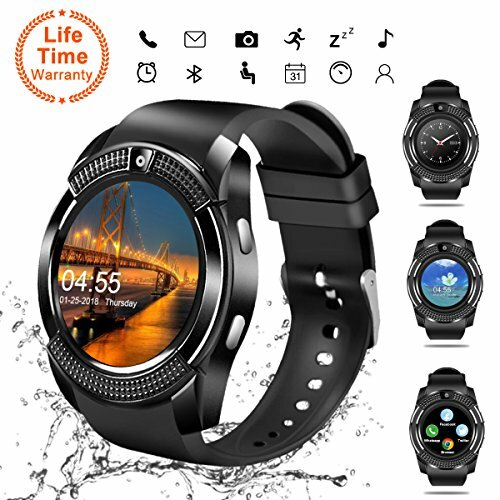 This is a new upgrade android/iOS smart watch with so many functions, easy to use, you can buy this phone watch for yourself, your child, your parents, your lover and your friends. Don't worry about the after-sale problems, we provide lifetime refund service without reasons.